Overheating may be qualitatively described as the state under which a dwelling’s occupants may feel uncomfortably hot due to the high indoor temperatures (CIBSE, 2013). It is now well understood that indoor comfort and wellbeing are critical for human health since people spend the majority of their lives inside buildings (WHO, 2009). The increase in frequency and severity of heatwaves along with the increase in thermal insulation and airtightness will likely lead to a greater overheating risk (HMG, 2016; Shrubsole et al., 2014).. Under extreme circumstances, the possible consequences could be catastrophic, as indicated by the aftermath of the 2003 European heatwave. An increase in mortality of more than 2,000 was recorded in England and Wales (Johnson et al., 2005), and nearly 15,000 in France (Fouillet et al., 2006). The accurate and systematic prediction of overheating risk is necessary in order to mitigate its possible effects (ZCH, 2015). The Chartered Institution of Building Services Engineers (CIBSE) has recently released a new methodology in predicting the overheating risk of new dwellings, described in Technical Memorandum 59 (TM59). This is based on the use of Building Energy Simulation (BES) which although have powerful dynamic modelling capabilities, are still limited by their core assumptions. 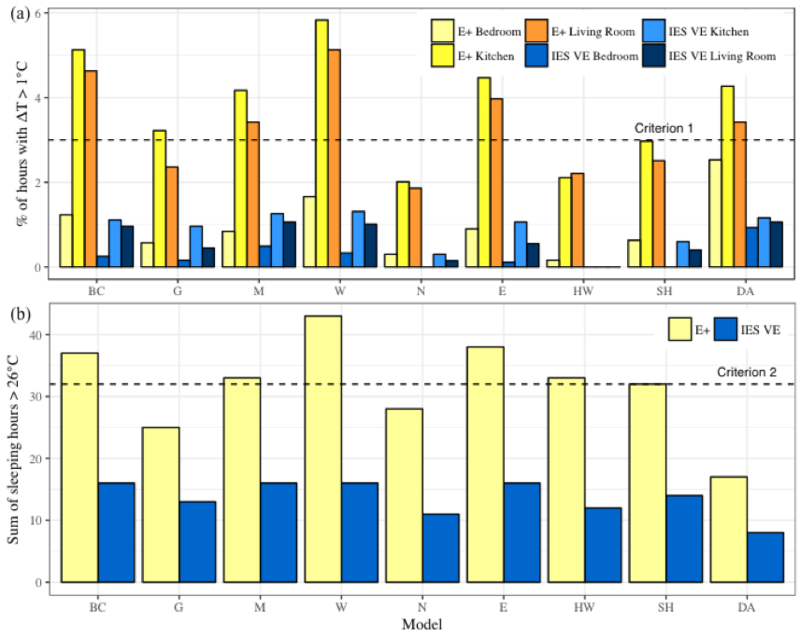 Given the exact same inputs, two BES tools may generate different predictions of building energy and thermal performance due to their algorithmic differences (Judkoff and Neymark, 1995; Crawley et al., 2008; Raslan, 2010). This has motivated this project, with its aim being to establish how the overheating risk prediction may differ between two commonly used BES software: EnergyPlus and IES VE. To establish the differences, nine permutations of the same basic case have been constructed identically in both software, following the TM59 guidelines. The base case was a lightweight, top-floor, single aspect, south-facing flat (Figure 2). The permutations form part of local sensitivity analysis, investigating the factors which the literature identified as the most important with regards to overheating. Each permutation was compared between the two software in an inter-model testing procedure using TM59’s overheating criteria. Permutations have also been compared with each other to highlight the effect of the changes from the base model on overheating risk for each software. Figure 1: Visualisations of the base case (a), case with external shading (b) and the dual aspect case (c) using the IES VE Model Viewer II. A set of preliminary results are shown below in figure 2. It is evident that there is a distinct difference in the prediction of overheating risk between the two software. EnergyPlus predicted a high risk of overheating risk in seven out of the nine cases, contrary to the prediction of low overheating risk in all cases for IES VE. Comparing iterations, there is a close agreement of the predicted results with the literature, with North-facing, heavy-weight and external shading models predicting the lowest risk of overheating for either software. The choice of building simulation software could have a significant impact in the prediction of overheating risk. EnergyPlus generally predicts higher temperatures and greater overheating risk than IES VE. The software generally agreed with the literature on which factors influence the indoor temperatures the most. Currently, a comparison of the algorithms used in the thermal modelling of each software is underway as to establish the root of the predicted differences. Global sensitivity analysis will also be performed to see how the input parameters interact with respect to overheating risk for each software. In the future, empirical validation and subsequent calibration of the two software will be performed.